I suspect most people who read this and similar blogs are familiar with the term ‘filtered permeability’, and what it implies. Maybe a better term is required; perhaps it isn’t particularly easy for the general public to grasp what it means. 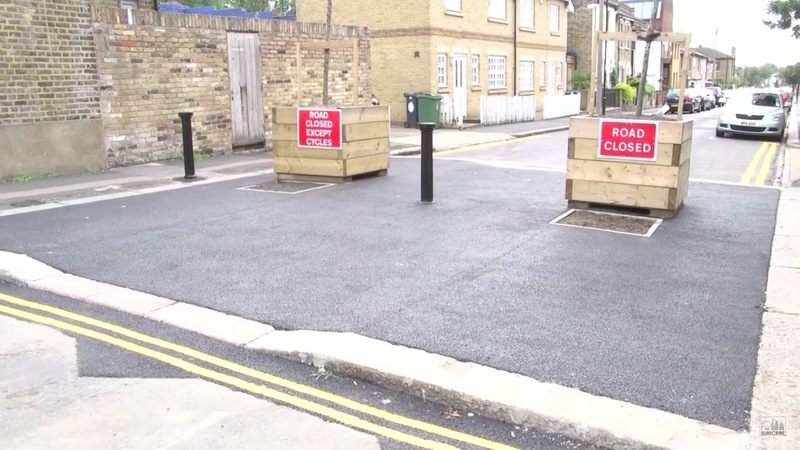 But it is certainly better than ‘road closures’, which has been used, problematically I think, to describe elements of the improvements in Waltham Forest. This is mainly because roads that have been filtered aren’t ‘closed’; they are still open as they were before to walking and cycling, and are still accessible to motor traffic, albeit by slightly longer routes than before. The first form of filtering is quite obvious; the second perhaps not quite so obvious. Recently I illustrated how a large residential area in the centre of Utrecht has had through (motor) traffic entirely removed from it, with the use of one-way flow for motor traffic, arranged in different directions. The blue arrows indicate directions for motor traffic; the red indicates the boundary of the cell. It is not possible to drive through this area, only to access it. The result is streets are that pleasant and quiet; safe enough for children to play on, even without any physical barriers on the street. The final alternative is a simple signed restriction on motor traffic, without any barriers at all. In urban areas, this kind of filtering has to be used carefully, I think, as signs like this are easy to ignore, or misunderstand. They should really only be applied on streets that look like places you shouldn’t be driving through; simply putting up this kind of sign on a conventional road isn’t going to be very effective. But in rural areas in the Netherlands, and indeed elsewhere in Europe, this restriction is quite common, usually because it makes basic sense, once motor traffic has a faster parallel main road. We haven’t got around to employing this kind of restriction in Britain. Having looked at ‘how’, the obvious next question is ‘why’? From a cycling perspective, the main function of filtered permeability is essentially to create streets that are attractive to use, that can form part of a usable network composed of these streets, and protected cycleways on main roads. Filtering still allows motor vehicle access, but reduces motor traffic to a level comfortable enough for cycling to be a pleasant experience on the street, for anyone. This has been described as 100% separation by David Hembrow, and is also neatly summarised by Steve Melia in his new book, Urban Transport Without the Hot Air. Separating cyclists from traffic does not mean building separate cycle paths on every street; separation can be achieved by strategically blocking streets to through traffic. The Dutch (in particular) have gradually built a network using a combination of quiet streets and separate cycle paths, which enables most people to avoid traffic almost all of the time – and to do so without significant detours. Filtered permeability, combined with physical separation on main roads, creates a dense grid of cycle routes, a cycle network that connects up all the start and end points of potential cycle journeys. Melia also makes the point that, while filtered permeability is an important part of a policy that creates direct cycle journeys, it also serves to make journeys by car less direct, and that this serves to make journeys by bike (and also by foot) relatively more attractive than they might otherwise have been. This probably does have some kind of effect, although I think we should be very wary of overstating the ‘discouraging’ effect of making car journeys about 10% longer (or more, for very short car trips). Once you are in a car, it really isn’t all that much hardship to do a little more distance, because it does not involve any physical effort (which isn’t the case with walking or cycling). In addition you will find in the Netherlands that the routes drivers are directed onto, away from the residential or access streets that are no longer through routes, are specifically designed to allow easy, faster driving. In urban areas they will be 50km/h limits (~30mph), they will not have people cycling on the road, and they will add very little to journey times, despite being longer routes. What is really important is that bicycle journeys are as direct as possible; not that car journeys might be slightly longer in distance (if not necessarily in time). Another reason ‘why’ is that this isn’t just about cycling, at all, as can be seen from the photograph of the street in Utrecht. Removing through traffic means that streets are safer, quieter, and more attractive, places where children can play, as well as cycle to and from their front door, in comfort. These kinds of benefits need to be captured more by an alternative term for ‘filtered permeability’ – whatever that may be. 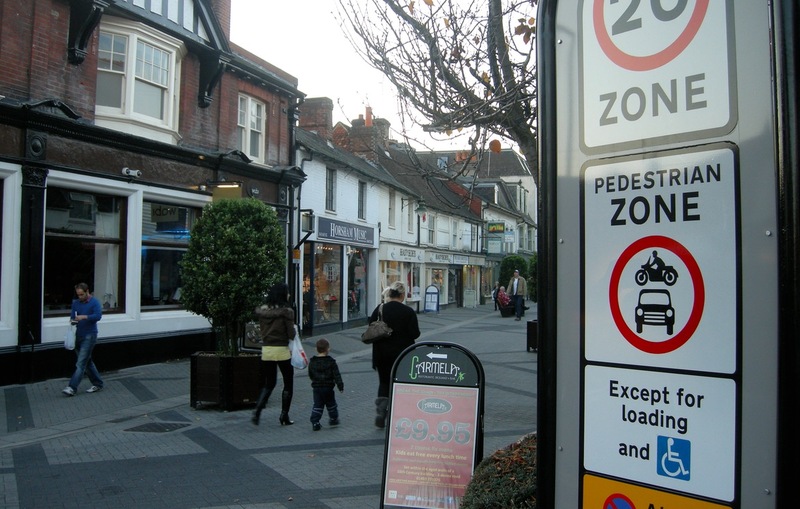 One final (and I think unexplored) effect of filtered permeability may be on vehicle speeds. My hunch is that simple conversion of streets that once formed through-routes into access-only roads will have a lowering effect on vehicle speeds, even without any other changes to the design of the road or street. I think this might be the case for two reasons in particular. Filtering changes the users of the street. A much greater proportion of drivers on the street will be people who live on it, or who are visiting people on it. The people who are using that street as a conduit to somewhere else will be entirely absent. Now of course many residents will still drive badly, or speed, on their own streets; but there probably is some effect in play here. I would like to see it examined. Filtering changes the directness, and length of street, on which speed can be attained. Look back at the map example of Utrecht, pictured above. Where once there were dead straight streets running from one main road to another for about a kilometre, filtering has cut out the straightness, meaning there is less opportunity to pick up speed. This would be the case without any changes or traffic calming on the street itself. Warren Street in London seems to me to exhibit these potential effects. Filtered permeability, Warren Street, Camden. Image taken from here. 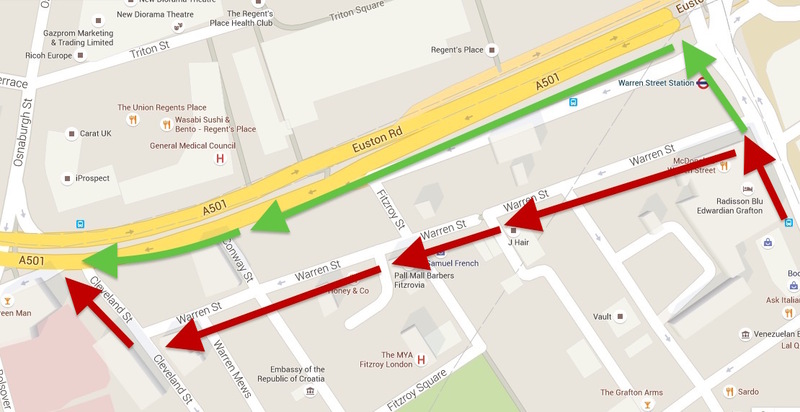 Prior to this filtering, this street was an attractive shortcut for people travelling north, then west, out of central London – it allowed drivers to bypass the traffic signals at the junction of Tottenham Court Road and Euston Road, and also to bypass any congestion on Euston Road itself – the route shown in red. Motor traffic should be taking the route shown in green. 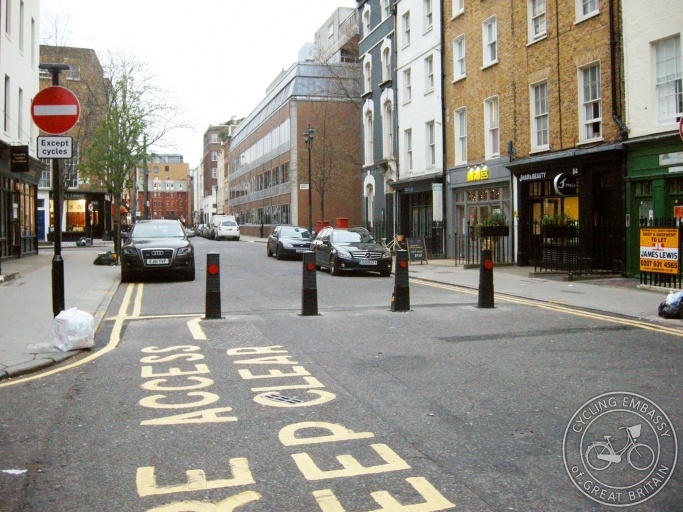 The bollards positioned halfway along Warren Street have changed this situation – they have removed it as an option for motor traffic attempting to bypass Euston Road, and the junction on it. 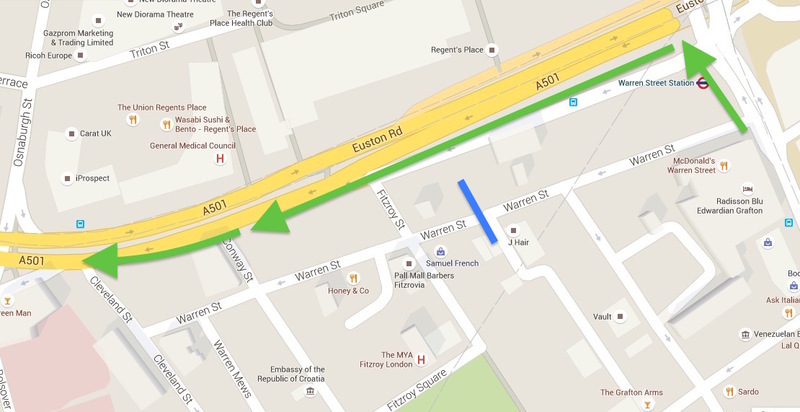 The bollards (marked in blue) mean drivers now have no option but to use Euston Road. What effect has this had on Warren Street? This is purely subjective, but my experience of this street is that, as well as greatly reducing motor traffic volume, motor traffic speed has reduced as well, without any other changes to the street (as you can see from the photograph). This might be due to a combination of changing the users of the street, as well as halving the length of road drivers can accumulate speed on. What I would like to see, the next time a closure of this kind is implemented, is monitoring of vehicle speeds, to confirm whether this effect on speed is genuine, or imagined. The street itself shouldn’t be changed (at least initially) so the direct effects of filtering on speed can be examined. Of course, there might have been research of this kind already that I’m not aware of – in which case, let me know in the comments! Taking the very first point you make – that “road closure” is not a good term to use for this kind of development – I would suggest, in combination with your observation that filtering means a much larger proportion of drivers on a street will be residents, which is surely true, that a term like “removing through traffic” or “creating residents’ streets” would sound much more attractive. Most people don’t like the idea of lots of speeding traffic on their street (however happy they are to speed on other streets!) so this sounds quite positive for those who live on and around the “closed roads”. In Poland, for removing through car traffic sometimes a term “kameralizacja” is used which could be translated as “cameralisation” (giving something a cameral character) which IMO sounds rather positive. I think the idea is dividing something into ‘chambers’, so we would probably say ‘compartmentalisation’ ? I consistently use the term `permeability for walking and cycling’. As in; just install permeability for walking and cycling across both ends and be done with it. IME, none of the `general public’ fail to grasp the distinction once the modes are spelled out in this way. A few of the shrewder ones will point out that motor cycling is a type of cycling and that it will probably also be permeable to horsing/ skateboarding/ wheelchairing. But even as they are saying it, you can see the realisation dawning in their eyes that this is not quite the killer objection they were aiming for. I’m a Covent Garden street performer, which means that I regularly work on any day of the week and most regularly at the weekend. I often work on a Sunday, when there is no congestion charge and parking is free. Usually I cycle in (from London W10), but on Sundays, especially if the weather’s a bit rubbish. I drive in because I can. I used to use the Warren Street cut through every Sunday, because it was was there, and as a local (who spent much of the eighties as a cycle courier) I knew it was there and there is still a part of me that, on a Sunday, in a queue on the Euston road, regrets that the barrier has been put in place. All of this is anecdotal, but my point is that, if the cut through is there, it will be used. And it will not be, not used, by persuasion. or education, or speed humps, but only by making it slower. or more awkward, or impossible. Also, last Sunday, in a hurry to get to Notting Hill from Covent Garden I worked out, in my head, a route through the back streets of Marylebone, using my old cycle courier knowledge. But west of the Edgware Road I followed the Black Cab in front of me to find the best route through Bayswater. It saved me time, and suggests that, if you leave a loophole it will be found and used, not just by cab drivers, but by anyone, including me, who usually cycles, but just happened to be in a car and in a hurry, and knew the back street route. I think my personal experience (and minor confession!) 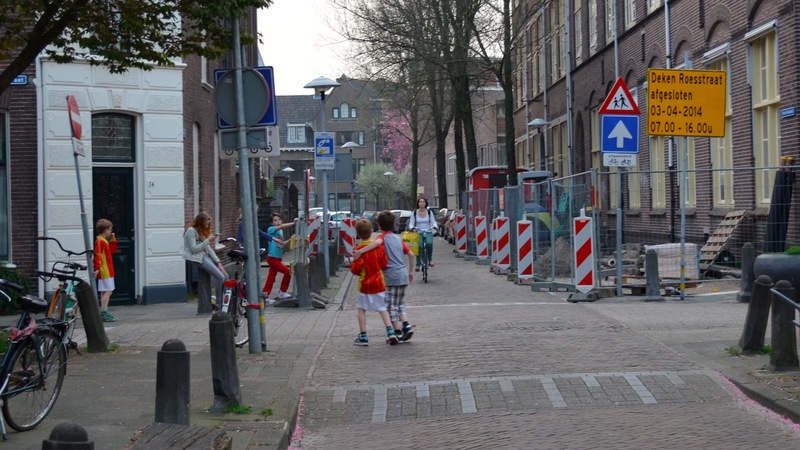 backs up the contention that filtered permeability, or whatever one wishes to call it, on the Utrecht model is the only way forward. On the point about the speed of residents, I’ve been doing measurements using a webcam and speed measurement software on the London street where I live, as there is lot of rat runners using the street as a shortcut. The street is about 350m and I’m measuring about half way along and only measuring speeds in one direction as this is the direction used by rat runners. It is possible that some residents are accelerating to over the 20mph limit at the point where I’m measuring but this will really only be applicable to quite small number of houses on the street and this will be dwarfed by the number of rat runners which is a few hundred cars an hour at peak times. 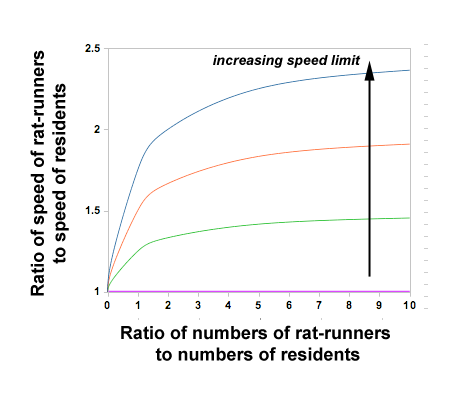 It shows that if rat-runners go faster than residents, once there are about twice as many rat-runners as residents, rat-runners dominate the road speed. Less obvious is that unless rat-runners stop on a street as often as residents (highly unlikley), and if both rat-runners and residents drive similarly under similar conditions (plausible), the rat-runners average speed must be higher. So if you want a “nice neighbourhood” without selective road blocking, you have to ensure only very few rat-runners find it worthwhile to drive through. As Neil Alize Illing says, though, there are a whole bunch of distinctly cycle-unfriendly ways that councils have traditionally done this. It’s very, very quiet. Unfortunately in this case the developers didn’t create much filtered permeability to make cycling or walking routes more direct than motor routes. A local rat run I ride through has been made worse by the local council! Yes, they have reduced speed limit to 20, put in speed bumps and chicanes, As well as putting up ineffective Access Only signs. The main problem I have is with chicanes; I just don’t like playing chicken with a car! I wouldn’t rely on the fact of living in the street to get all local residents to behave nicely. Even if they have kids playing out / cycling – if they have a sense of driver entitlement they may even drive worse as they are not having to worry so much about the (reduced number of) rat-runners. Perhaps the best way of getting through to them is to have strong local community engagement, where the undesirability of bad driving / speeding in the vicinity of (increased numbers of) children/elderly walking/cycling/playing is made clear. There is research work done on what happened with Home Zones in the 80s/90s. They were designed with low speeds (sub 20 kph) in mind and generally had a lot of physical features backing up the non-motorised function. There would be a lot of community consultation. One account I remember was how small numbers of residents wanting to hang on to their driving habits could have an adverse effect far beyond the numbers involved. Do drivers ever try to bypass those bollards using the sidewalk in the last photo (Warren Street)? Hopefully that’s not the case, but it doesn’t look hard to do. Focus must be on areas – term “cell” was used in op. Home zone ? Woonerfen. And what happened to 8 mph speed limits foe campaigned for? Waltham Forest experience is possibly exemplar on how to do it – including failed high court action and huge amounts of consultation. 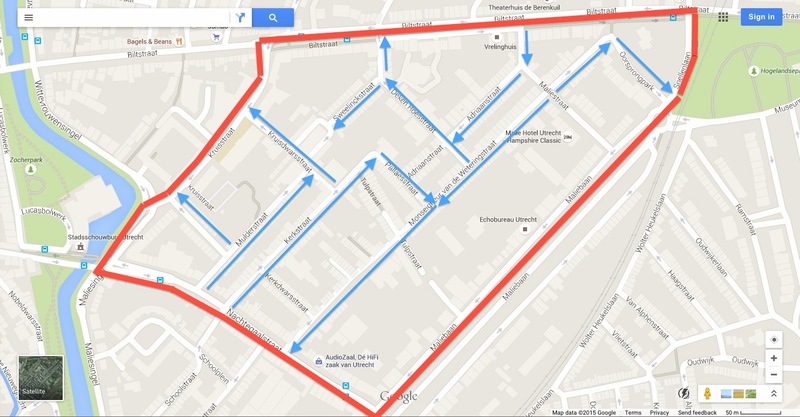 Do need some new terms – concept of cloisters in a neighbourhood?